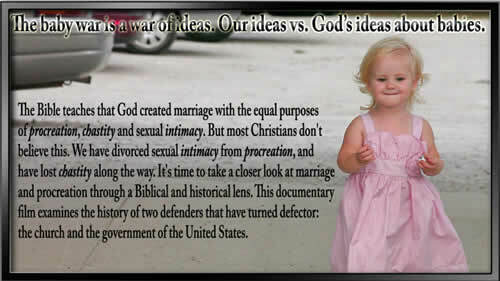 The Bible teaches that God created marriage with the equal purposes of procreation, chastity, and sexual intimacy. But most Christian Churches don't teach this, or even say much about it. We have divorced intimacy from procreation, and have lost chastity along the way. It's time to take a closer look at marriage and procreation through a Biblical and historical lens. This documentary examines the history of two defenders that have turned defector: the church, and the government of the United States. Order Your Copy Of "The Baby War: Defenders and Defectors" Today! 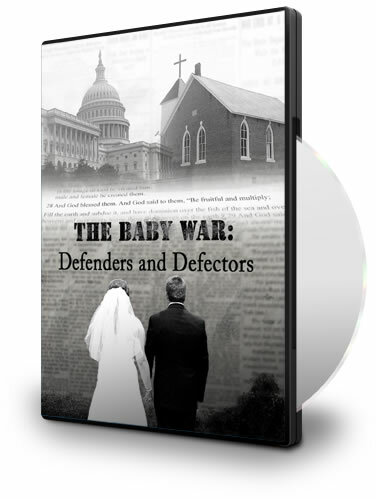 "The Baby War: Defenders and Defectors"
Order your DVD/CD today. Watch it, listen to it, and examine the contents for a full 30 days. If after examining the DVD/CD you feel that this material is defective, call us and tell us you’d like to return the DVD/CD for a replacement. We’ll give you a return authorization number for the defective merchandise and ship you a new DVD/CD right away. 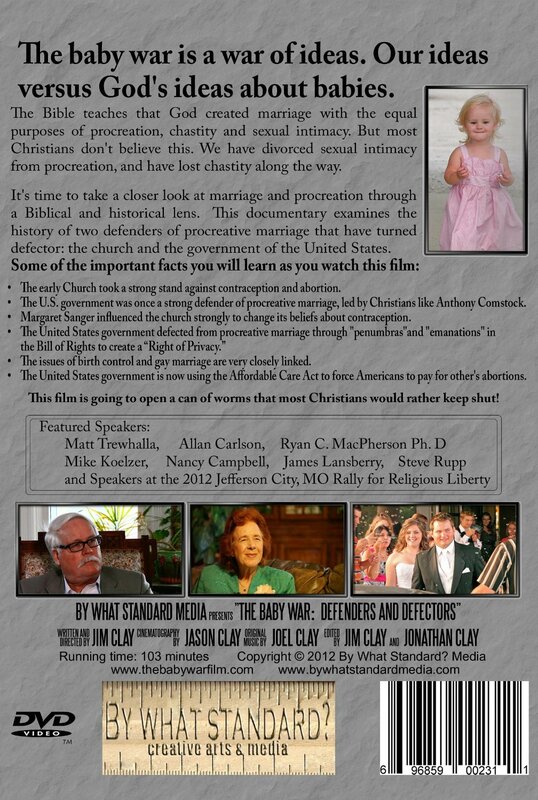 This is one of the best DVDs out there about the truth about birth control and our ideas versus God's ideas about babies. It looks at the what the early Church taught about it, the role the U.S. government has played in the issue, Margaret Sanger's influence, and how it is linked to moral issues including gay marriage. This documentary along with the two Birth Control bundle DVDs, are a necessity and very much needed in our day and society. We have strayed far from God's perspective on this issue. These DVDs will "open a can of worms that most Christians would rather keep shut!" This is one video that changed our baseline attitude towards children and being open to receiving them as God chooses to bless our marriage with them. Very informative and logical. Amazing what we American Christians don't know about our how faith, this DVD is mind blowing! Click the button below to add the The Baby War: Defenders and Defectors - DVD to your wish list.